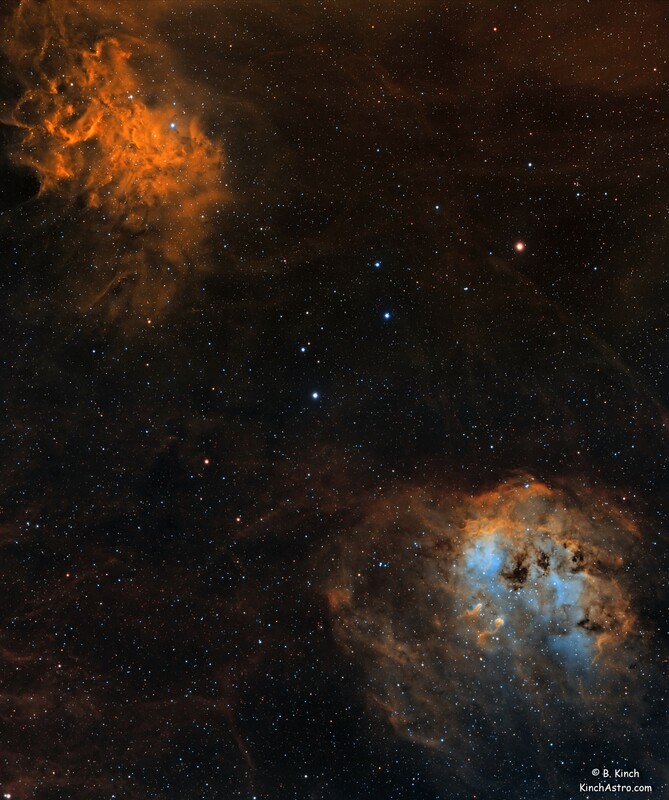 IC 405 & IC 410. First attempt at a mosaic - even if it is only 2 panels. IC410 nebula is commonly known as the Tadpole Nebula for the ‘tadpole-like’ structures of dense, cooler gas that are being shaped by the intense radiation from the hot stars of the young open cluster NGC 1893, embedded in the nebulosity. These are clumps of gas and dust left over from the formation of the cluster, and are likely forming yet new stars within them. The tails of the tadpoles are caused by the radiation pressure and solar wind from the stars of NGC 1893; note how they point away from the star cluster. IC 405 (also known as the Flaming Star Nebula, SH 2-229, or Caldwell 31) is an emission/reflection nebula in the constellation Auriga. It shines at magnitude +6.0. It surrounds the irregular variable star AE Aurigae and is located near the emission nebula IC 410, the open clusters M38 and M36, and the naked-eye K-class star Hassaleh. The nebula measures approximately 37.0' x 19.0', and lies about 1,500 light-years away. The nebula is about 5 light-years across. Resolution: Original was 4056x4849, reduced to 3042x3637 for web link. Frames: Total Integration 22 Hours 20 Minutes. Integration: 12 hours 20 Mins.